island beaches across the state of Kerala. 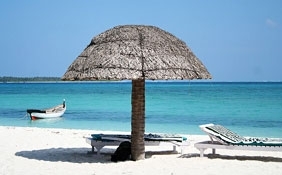 In the southern end of the country, the states of Tamil Nadu, Karnataka, Kerala, and Andhra Pradesh have a number of spectacular beaches where vacationers opt for complete relaxation, water cruises, and water sports. The eastern and western sides of the country are home to a grand coastline and famous Indian beaches. The area around Marine Drive, Juhu Beach, and Chowpatty are popular areas for relaxation. Evenings by the sea promise an amazing ambience, bustling with people and excited kids. The food outlets around Mumbai beaches are ever crowded. Kovalam Beach in Kerala - Undoubtedly, this is the most popular hideout for sea lovers. One of the finer beaches of Kerala, the coconut groves, resorts, and the sun bathing zones have people relaxing all day long. 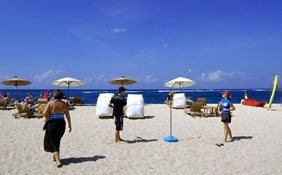 Even on an extreme sunny day, you will find foreign tourists lying on the sandy shores and enjoying the cool air. Juhu Beach - This beach owes its popularity to the amazing crowd of people enjoying the incoming waves of the Arabian Sea. Situated around 18 km from Mumbai city, horse and pony rides are a must activity here. Easily accessible from Santacruz and Andheri, Juhu has attractions like Siddhi Vinayak Temple and St Joseph's Church located within walking distance. 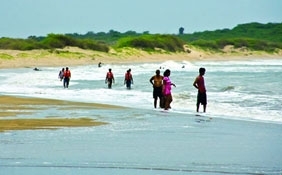 Calangute Beach, Goa - You cannot miss touring Calangute Beach during your stay at Goa. Known for its water sports, beach spa, massage centers, and coconut groves, Calangute is one of the most popular beaches in India. 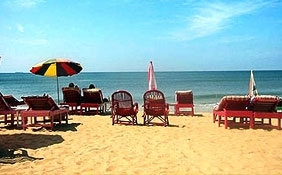 Other frequently visited beaches of Goa are Anjuna, Vagator, Palolem, and Dona Paula. Marina Beach of Chennai - In the southern coast of Tamil Nadu, Marina Beach borders the Bay of Bengal and the Indian Ocean. It is the longest of its kind in the state. Food stalls and shops around Marina make it an ideal hangout during evenings. Colonial statues that have symbolic importance to the state and serve as important city landmarks can be seen around this place. Picturesque landscapes, placid waters, and beach amusements make the Luxury Beaches in India score high on the tourist's itinerary.